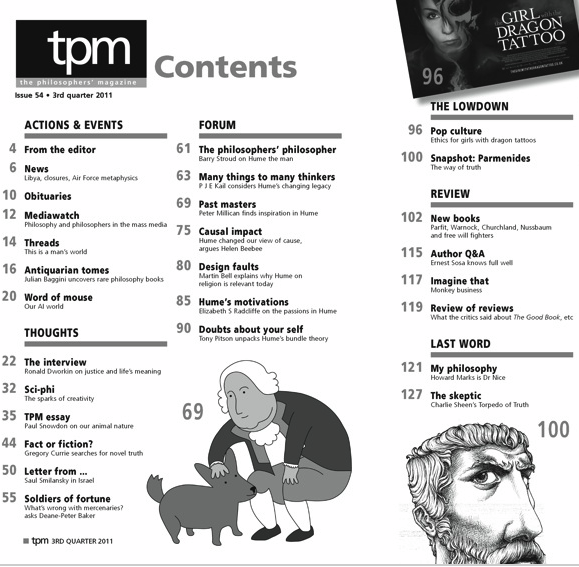 The new issue of The Philosophers' Magazine is full of good stuff--see above. In the reviews section, which I've started editing, we've got Neil Levy on Patricia Churchland (Braintrust), Thom Brooks on Martha Nussbaum (Creating Capabilities), Jussi Suikkanen on Derek Parfit (On What Matters), Scott Aikin and Robert Talisse on Mary Warnock (Dishonest to God), Troy Jollimore on Hubert Dreyfus and Sean Kelly (All Things Shining), and "at the movies," Dana Nelkin and Sam Rickless on The Adjustment Bureau. My column is about The Evolution of Bruno Littlemore, a novel by Benjamin Hale. Seriously weird, totally great. 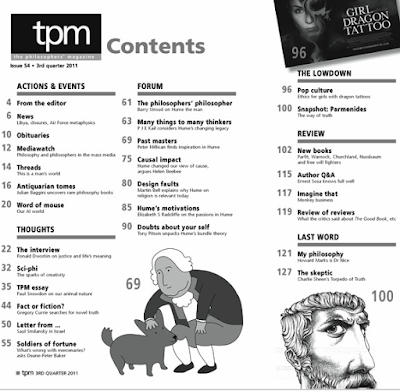 More about the magazine and how to subscribe is here.